If you have ever read or seen Peter Pan then you may think that you know the premise. Peter Pan is a boy who lives in a magical place called Neverland. Not only can he fly, but he keeps company with a fairy named Tinkerbell, and has a band of followers called the Lost Boys. His arch nemesis is Captain Hook- a wily pirate who hates Peter Pan and would like nothing more than to see his demise. But one of the most magical elements of the whole story? Peter Pan and his Lost Boys never grow up- they’ll be young boys forever, getting involved in all sorts of adventures. Now what if this story as you know it was turned on its head? What if Peter Pan was actually the bad guy? What if Captain Hook used to be his best friend- the first Lost Boy- and wasn’t as black-hearted and villainous as Peter has always said? What if the version of events that J.M. Barrie introduced to the world was a lie? 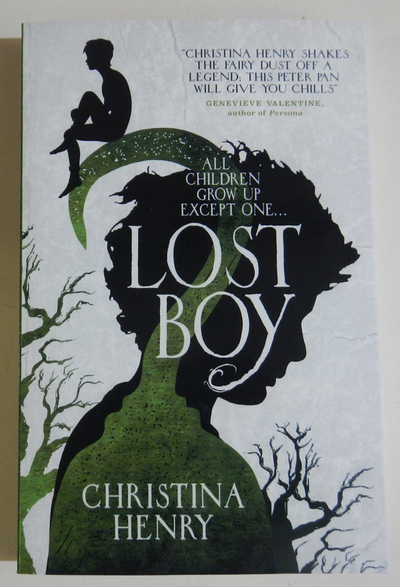 Christina Henry, author of the Alice In Wonderland re-workings Alice and Red Queen, has taken on the task of rewriting Peter Pan’s story, from the perspective of Jamie (who is later known as Captain Hook). Jamie is the responsible one- the one who keeps all the boys clean and fed, and makes sure they are looked after. He is the one who nurses the sick and buries the dead. He is Peter’s right-hand man and the best fighter, and while the other boys all adore Peter (their leader), they look to Jamie for everything else. In comparison to Jamie, Peter is only interested in having fun- he wants to swim with mermaids, go on raids and kill pirates, and watch the boys fight in the arena they have found specifically for their games of Battle. If blood is spilled, he is happy. If one of the boys becomes sick, they become a nuisance. If one of the boys dies, he is indifferent, and soon off in search of a replacement boy from the Other Place. Jamie, like all of the boys, originally adored Peter and would do anything for him. But as time goes on, he becomes more and more disillusioned with Peter and his life on Peter’s island. He starts to see through Peter’s lies and begins to despise the lack of consideration and care that he has for his followers, most of whom have escaped a horrible life in the Other Place only to die at the hands of the pirates, the Many-Eyed (large monsters that are the equivalent to spiders in our world), or disease. This is an imaginative reworking of a classic tale, with the author succeeding in creating a darker and more complex version of events within the novel. She is able to twist the narrative, and make you re-examine the way you previously thought about the original Peter Pan story. If you’re looking for a unique variation on a well-loved tale, then look no further than this novel.